I've become a real fan of cooking with lavender and this beautifully moist and flavourful roast chicken is the reason why. The key to cooking with lavender is to not use too much. A dish can go from floral to soapy with just a touch too much lavender. So be sure to measure your lavender carefully and trust your tastebuds and nose. Spatchcocking a chicken allows it to cook faster and keeps the meat moist. Because of the even exposure to the heat, the thighs, legs and breast cook more evenly than when cooking a whole chicken. You could ask your butcher to spatchcock a chicken for you but it is pretty simple to do on your own. Using sharp kitchen scissors, cut the chicken down each side of backbone and remove bone (keep the bone for stock). Turn the chicken over, breast side up and press firmly on the breastbone to flatten it. You'll hear the bone crack. Flatten the chicken and tuck its wings behind the breast. It is as easy as that! You can find many videos online showing you this technique. Here is one: https://www.youtube.com/watch?v=72dQonQa9jE. Enjoy! 1. Preheat the oven to 475F. 2. Using a mortar and pestle or an electric spice grinder, grind together lavender, thyme, winter savory, peppercorns and kosher salt. Transfer to a bowl and add the softened butter. Mix until well combined; set aside. 3. Gently easy your fingers under the chicken’s skin to separate from the bird, creating a cavity across the top of the breast and around the legs. Using your hands, spread some of the butter under the skin, smearing any remaining butter over the top, massaging it around the legs and wings and generously season the skin with salt and freshly ground black pepper. 4. Place chicken in roasting pan, breast side up. Pour white wine and water into pan. 5. 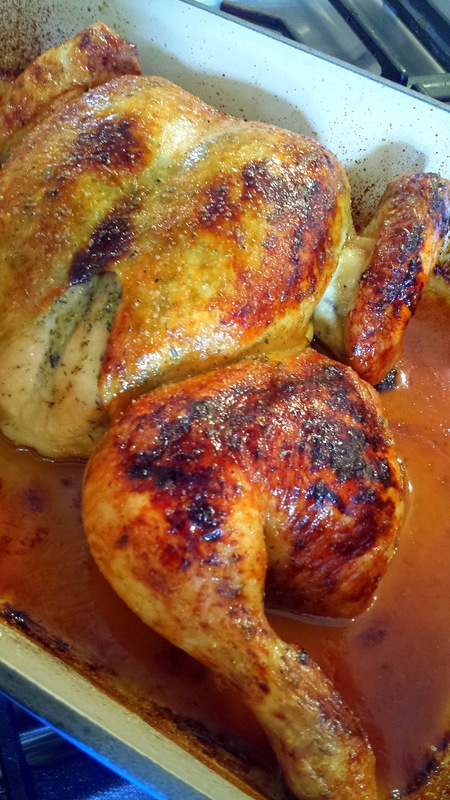 Place chicken preheated oven immediately reduce the heat to 375F. Roast for 20 minutes. 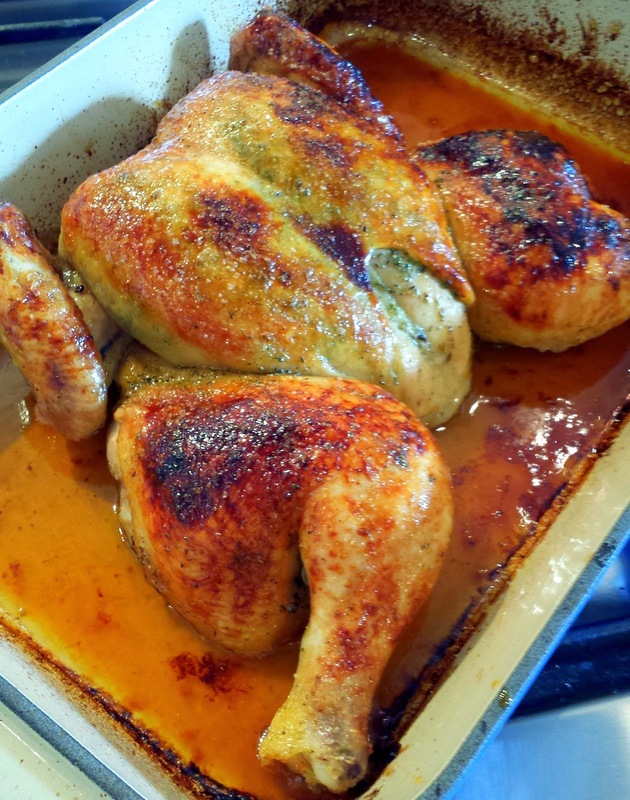 Remove chicken and brush the outside skin with 1 tablespoon honey then return to the oven for 10 minutes more. Remove from the oven and, using a large spoon, baste with the pan juices, now mingled with the honey. Return to the oven and roast for 10 minutes again. Remove the chicken again, spread with the remaining honey. Roast for 10 minutes more, then baste again with the pan juices. Sprinkle the skin with a little more salt and freshly ground black pepper. Cook for 5 minutes more and remove from the oven. The chicken is done when the juices run pinkish clear when the breast is pierced at its thickest part with the tip of a knife, or an instant-read thermometer inserted into the thickest part registers 165°F. The skin should be crisp and golden brown. 6. Let chicken rest for 10 to 15 minutes, covered with foil, before carving.